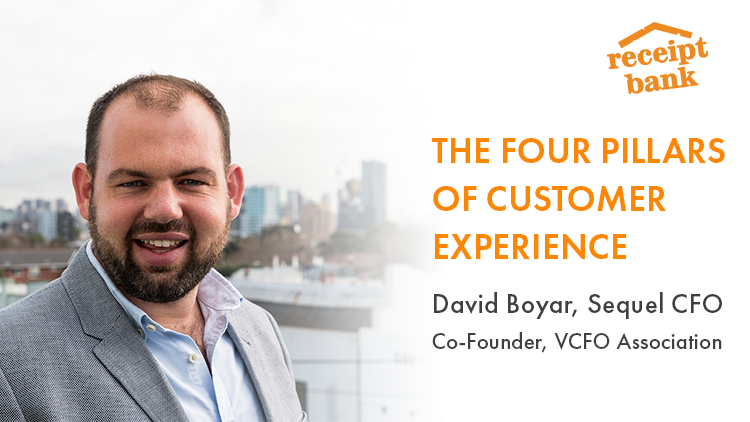 David Boyar, founder of Sequel CFO and founding Vice President of the Virtual CFO Association, shares his thoughts on why you should adopt a client-facing approach. The moment I started thinking about Sequel CFO as a business, rather than a practice or a firm, everything began to improve substantially. As a business, the onus was on us to define our services, our value proposition and the roles of the CEO and COO. We had to set sales targets – yes, sales targets for accountants – but most importantly of all, we had to think about the nature of the service we provide to our clients. The result of this process was a clear idea of the customer experience we wanted to provide. This experience is ultimately why businesses choose to come to us, and tend to stay with us - we run on a philosophy of service first. We recently brought in two new business partners, and are recruiting more to meet our sales targets. As part of this process, we deconstructed and documented the way we work. We did this because without the right guidelines in place, new members of a team can struggle to fit into the company culture. We wanted something teachable and scalable, so that we could maintain a consistent message across the business. We ended up creating the following four pillars, which we use to define our customer experience. Hopefully you can adapt them to your own business, particularly if it’s a service-based business. Be warned: it wasn’t a quick process, you have to put in the hard yards if you want to optimise your customer experience. Every single person on your staff, from the most junior to the most senior, should understand what it is that your business offers clients. This gives everyone a standard to aspire to and helps shape their decision-making framework, as they know what’s important and how to get those results every time. One way to approach this is to sit down with the members of your team and ask they what they think the value proposition of the business is. You can lead the discussion from there, and try and bring the team with you to arrive at the same destination. Make this a vital part of training whenever anyone joins your team to ensure consistency. If you don’t, staff members tend to lose enthusiasm for the business and under- or miss-sell your services. I had never thought much about company culture until I lost a staff member early on. To quote his resignation letter, we were “too dynamic” as a business. I’ve been convinced ever since that having a strong sense of culture is essential. It should define your business: who you are, how you came to be, and where you want to go next. Figure out what that is through discussion and debate with your team, then refine those ideas until you’ve got a watertight set of principles that sum up your company. Whenever possible you should hire for attitude over ability, and trust that your quality control systems and a culture of learning will take care of the rest. In most cases, the first question when hiring should be: are they right for this business? If they’re not, they will inevitably disrupt the consistency of your customer experience. Of course, in order to get results you need a combination of individual attitude, company culture and careful training. Get all three of these cylinders firing in order to perfect your customer experience and boost your staff retention rates. A customer experience is best measured by the expectations of the customer against the service they are provided with. These expectations are set by your marketing content and your sales process. At its baseline level of success, this is known as not overpromising and under-delivering. At its peak, this means surprising and delighting your customers. Establish a clear onboarding process for new clients, and continuously analyse and refine this process as your business scales and evolves. After a customer has been properly onboarded, they should know what you will provide to them, what their role in process is, and how exactly they can access the results. 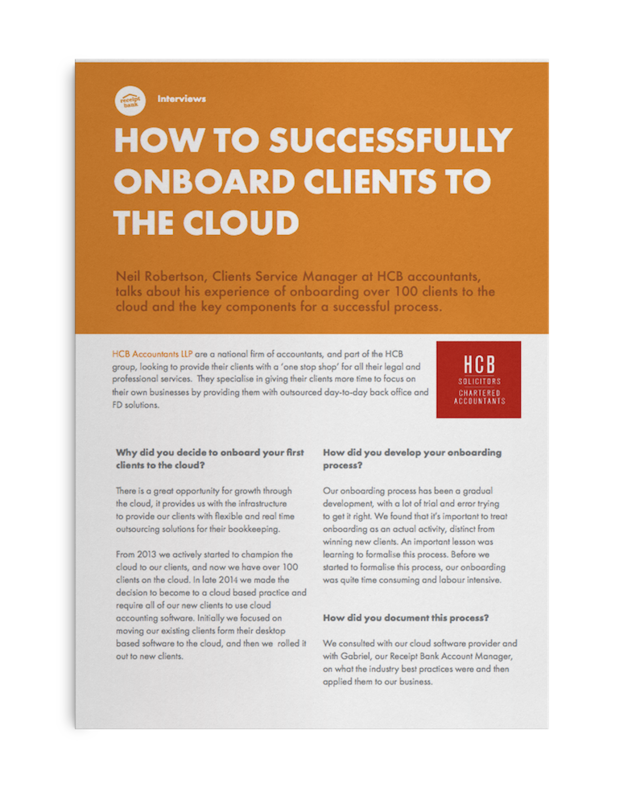 Onboarding may be in the form of a call from an account manager, or maybe an online training course - whatever it is, make sure your clients feel comfortable and ready to use your services. You should also define the level of service that customers should expect to receive whilst engaged with you, and ensure that both this and the onboarding process are key components in your staff training. If you can combine these four pillars, you’ll see your customer satisfaction skyrocket and your client base expand. After all, good customer experience is good business. Good customer experience starts with onboarding. In order to grow your firm and create a first-class customer experience, you'll have to start with creating a good onboarding process. In this interview, Receipt Bank partner Neil Robertson explains the building blocks for exceptional onboarding process and how it benefits your firm.